Dominic Thiem almost pulled off an upset win over world No. 1 Rafael Nadal in their US Open quarter-final on Tuesday night. Now we know why! Well, minutes before the big game, the Austrian star took practice on to another level by hitting the balls with toilet paper and a bottle of energy drink. In a video that surfaced online (see below), Thiem can be seen performing the regime in a quest to get the ball right on the middle of the racquet. It helped him to a great extent, even as the result didn’t fall in his favour. The 25-year-old took the first set 6-0 but eventually lost in the fifth-set tie-breaker. 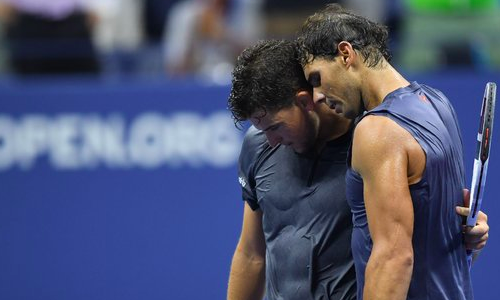 Nadal prevailed 0-6 6-4 7-5 6-7 7-6 in a gruelling battle that lasted four hours and 48 minutes on Arthur Ashe Stadium. The Spaniard is now scheduled to lock horns with former champion Juan Martin del Potro of Argentina in the semi-finals on Saturday.